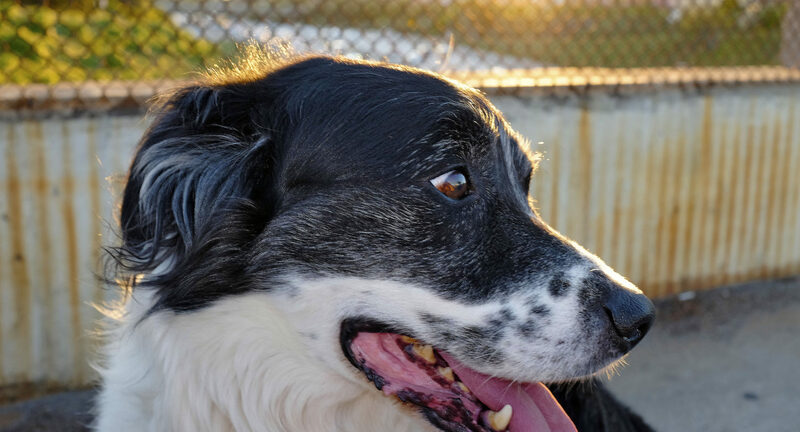 For the past sev­en years, I’ve had a black and white dog by my side. He is called Bud­dy, but I didn’t name him. My friend Julia had asked me to fos­ter him for a few weeks, and since I didn’t plan on keep­ing him, I didn’t both­er com­ing up with a bet­ter name than the one he came with. So he is Bud­dy. I looked for­ward to giv­ing him back to Julia. Then one day I fig­ured I’d take him to work with me rather than leave him behind to tear up my loft. That made all the dif­fer­ence. He was still skit­tish, he still had a hard time know­ing where to pee, but he quick­ly became a good boy. And even­tu­al­ly, he became a great dog. When I say he has been by my side for sev­en years, I’m not exag­ger­at­ing. When I’m home, he’s nev­er out of my sight, or, more accu­rate­ly, I’m nev­er out of his. 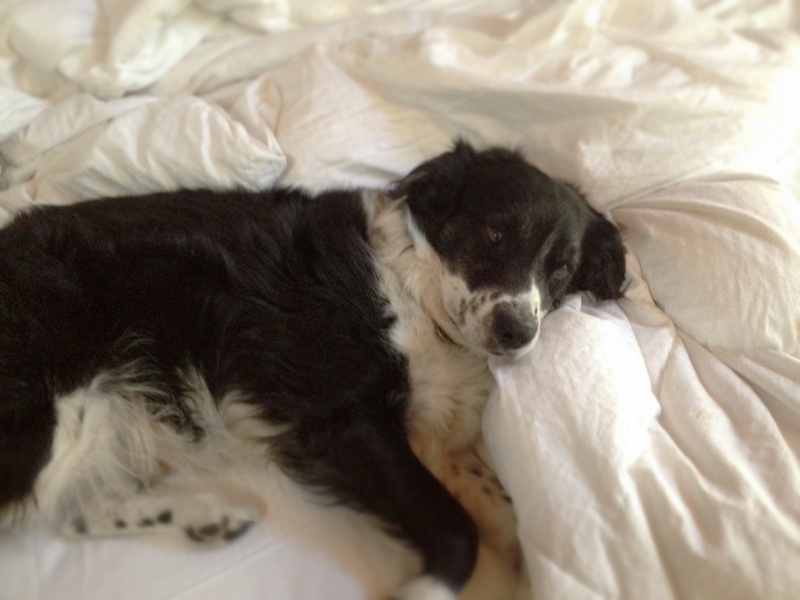 When I run up to my bed­room — two flights of stairs either to work or to grab some shoes or a sweater — he runs next to me, nev­er ahead of me, and when I run back down, he does the same. If I for­got my keys and have to run back up real quick, he’s right there. He goes down to the garage with me, out to the mail­box, over toward the kitchen, and if I’ve been ignor­ing him for awhile, he’ll sit behind me on the sofa so my hand has to rest on his ears and give him a rub. When I sleep he jumps on the bed and cud­dles, but soon he jumps off again and sleeps in the hall­way so he can keep an eye on me and on any­body else who might be in the loft too. Some­times I have to leave him home to run some errands, which is fine now. No more trau­ma or destruc­tion. But he does go ba-nay-nay nut­balls when I come home, jump­ing on me and run­ning through the house like I’ve been gone for days. Even if that’s hyper, it’s not a bad way to be wel­comed into your own home. I’ve had many good dogs who I love and miss, but Bud­dy is by the far the best dog I’ve ever had and real­ly the best dog I could ever ask for. But I have nev­er been able to fig­ure out what sort of dog Bud­dy is. He has the size and some of the col­or­ing of a bor­der col­lie, but he doesn’t have the more aggres­sive­ly shaped head, the crazy hyp­no-eyes, or the herd­ing instinct. My first dog was a Brit­tany Spaniel we called Coco, and I always felt Bud­dy had a lit­tle of that tem­pera­ment. Not because I know spaniels so well, but because Coco and Bud­dy have a lot in com­mon. So the oth­er night, when we were walk­ing down Abbot Kin­ney, a woman stopped me and asked me what kind of dog Bud­dy is. Before I could say any­thing she said he looks just like their dog, and that she just learned that her dog is a Spro­l­lie. We chat­ted a bit but I didn’t think much of it until I got home and looked up Spro­l­lies online. 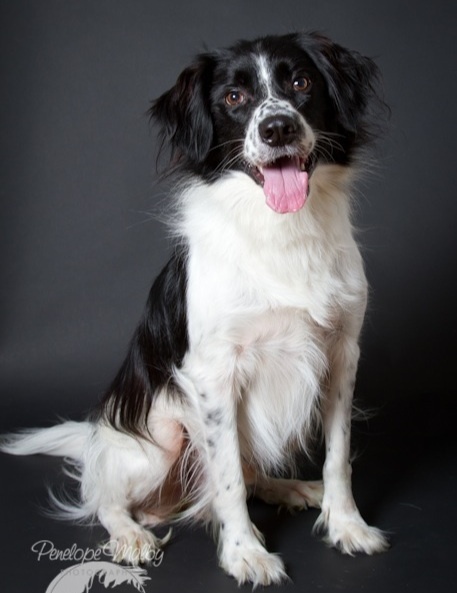 “Spro­l­lie” is a term used for dogs that are mix­es of springer spaniels and either col­lies or bor­der col­lies. It’s not an offi­cial breed or any­thing, nor do I think peo­ple are try­ing to cre­ate one. I think it’s just a way of iden­ti­fy­ing their dog, and I have to admit, I’ve nev­er seen so many dogs that look like Bud­dy. This is a dog named Oscar (already con­fus­ing, since my youngest boy is Oskar) and he looks like a close cousin. Maybe even a half broth­er. It’s odd­ly sat­is­fy­ing to know where my dog comes from. It makes me feel like I under­stand him a lit­tle more, it makes me appre­ci­ate his instincts and his lim­i­ta­tions, and it makes me for­get how much I hate words like labradoo­dle and spro­l­lie, so that’s some­thing.